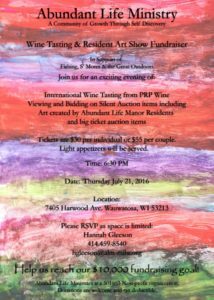 On Thursday, July 21st, Abundant Life Manor will be having a wine tasting and art show at 7405 Harwood Ave. in Wauwatosa. The auction will feature one-of-a-kind pieces by residents and all money raised will go towards Abundant Life’s highly anticipated annual camping trip. One of the featured artists, Hattie, says she finds inspiration in everything. Known as Abundant Life’s resident fashionista, Hattie’s work is colorful and abstract. Her primary medium is painting, but she also draws. As a quiet woman, art allows Hattie to express herself. The featured works range from self-portraits and cartoons to abstract expressionism. In addition to being stimulating and unique, the pieces offer insight into the psyches of a misunderstood and often marginalized population. Your support of this event will allow Abundant Life Manor to continue helping this underserved community. Please RSVP: Hannah Gleeson, (414) 459-8540 or hgleeson@alm-milw.org. Tickets are $30 per individual or $55 for a couple. Delicious wine will be provided. In addition to the wine tasting, there will be a silent auction and all resident artwork will be for sale.